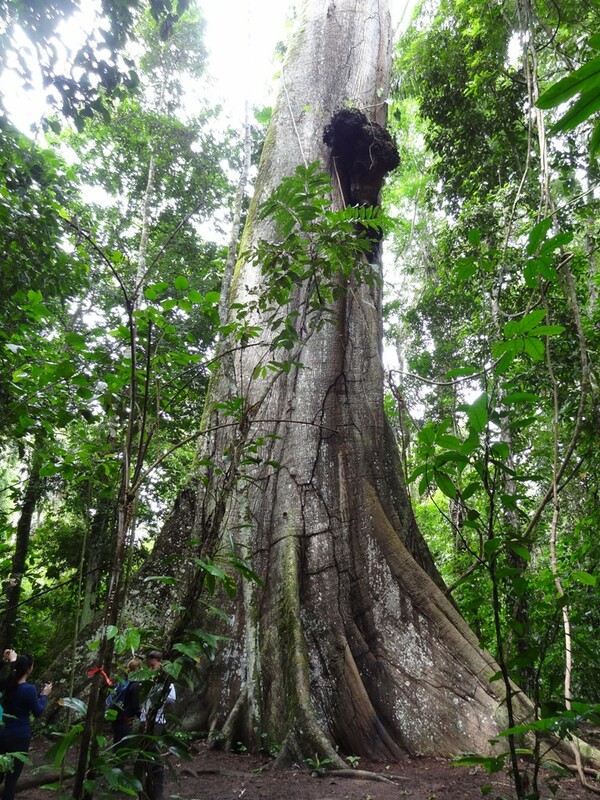 giant Ceiba Tree, more than 1000 years old! It is Saturday, 19 February, 5. 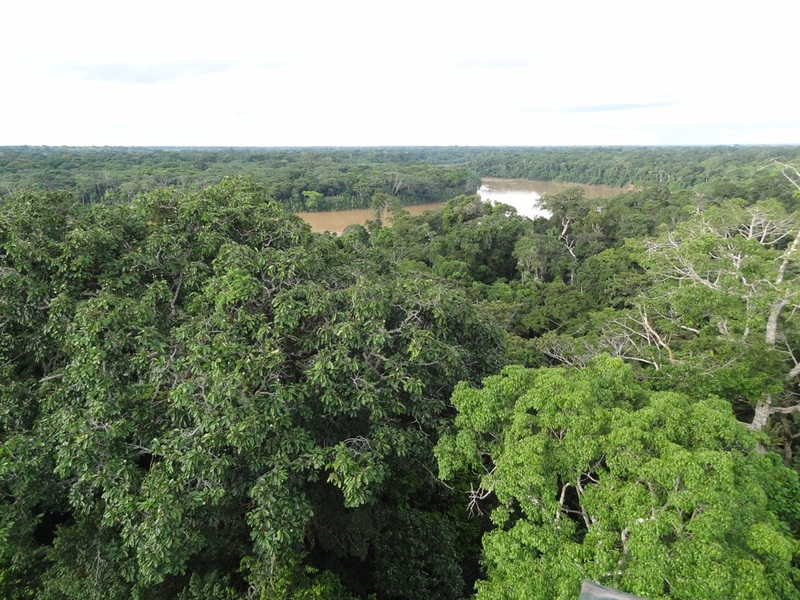 56 pm and I am sitting in my spacious, open room, facing the rainforest of the Tambopata National Reserve in Peru which is a mere 7 meters away from my porch. I hear crickets, birds and an endless number of other sounds that I don’t know (and whose owners I most likely don’t know either) as the sun is setting and it is getting darker very quickly. 2 employees of the Posada Amazonas Lodge just walked buy quietly, lighting the oil lamps which are the only source of light for the rooms in the evening. The big rooms consists of beautiful, rustic wooden floors, a straw roof that reaches high up, beds covered by mosquito nets, a little wooden table and 2 pieces of logs that function as stools and 2 outer walls, 1 wall completely made up of bamboo sticks and the 4th wall is replaced by a few bamboo sticks functioning as a separation between me and the garden which leads into the rainforest only a few meters away. The air has (or at least feels like) it has 100% humidity, there is not the slightest breeze. The only thing I feel and hear is the forest and how it is alive. Only 40 minutes ago we came back from our first little exploration in the rainforest, climbing high up on a 37-meter high viewing platform from which we were able to see the rainforest canopy, the Tambopata river, a view bright green parrots, some beautiful butterflies and endless green. According to the guides it has rained here for the last 4 days without a break, but today I was once again lucky ((or maybe being rewarded after all those cold, wet days) with sunshine and warm weather. This morning I took a short 40 minute flight from Cusco to Puerto Maldonado which is the main city here in the Madre de Dios region. Friendly Aldo who will be my guide for the next 3 days picked me and some other people staying in the lodge up from the airport and after a 20 minute bus ride we boarded a longtail boat and went on a 1.5 hour ride along Tambopata river. Although the air is extremely humid here I felt instantly happy because I traded a chilly 11 degrees for 27 degrees. I am simply a nice-and-warm-weather-girl, that’s a fact. 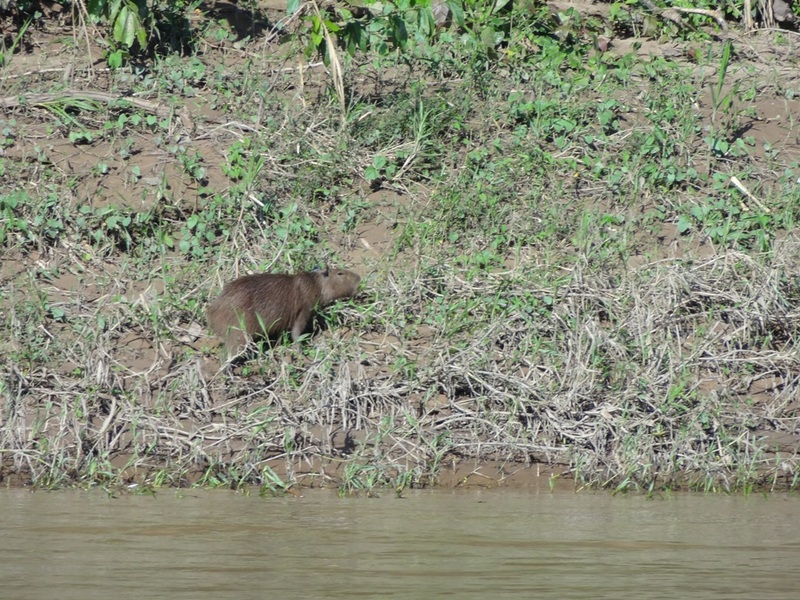 As we reached the shore we had another short 10 minute walk to the lodge and I was lucky enough to see an Agouti and Capybara, the biggest rodents on earth -it is a kind of guinea pig and looks like an oversized rat without the long tail. It had the funniest walk and wiggled his behind from one side to the other as it disappeared into the forest. 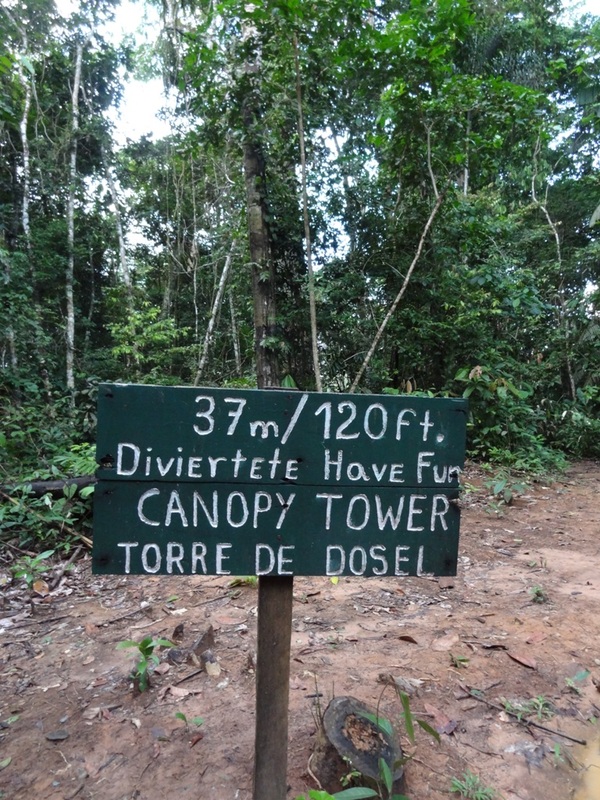 After a short briefing about the do’s and don’ts of the Lodge we were shown to our rooms and after a short rest or walking around the Lodge area we met for our first forest hike and to the canopy tower. 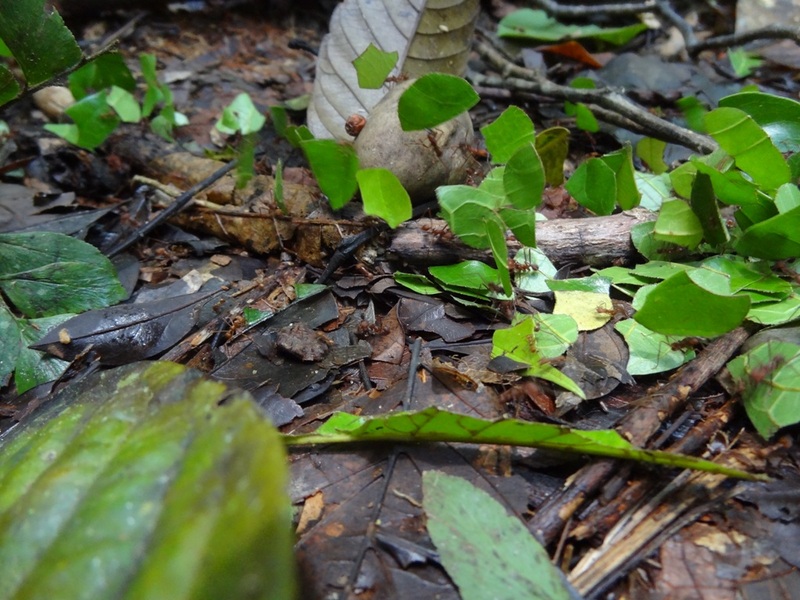 Every time that I have visited a rainforest I was overwhelmed at how great nature, plants and animals adapt to the circumstances they are surrounded by – and what amazing remedies plants provide against various diseases or pains. 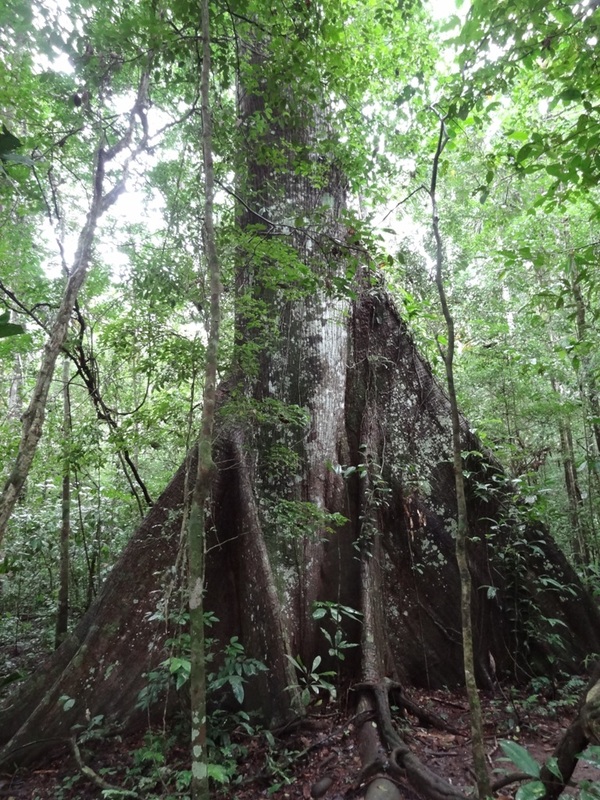 The rainforest has is all: from moving palm trees (yes, they walk via their roots 5-10 cm per year!) to trees which provide the main substance against malaria (and at the same time contain quinine, which gives Tonic water its nice and bitter taste) to leaf-cutting ants which walk through the whole rainforest and clean it buy picking and cutting enormous amounts of leaves every year – there is so much to learn and admire in this environment that I am truly grateful to being able to experience the rainforest once again. Right now it is 6.25 p.m, it is pitch-dark by now and all of a sudden the cicadas started their loud songs and in the distance I can hear something which sounds like a major reunion of a group of monkeys. 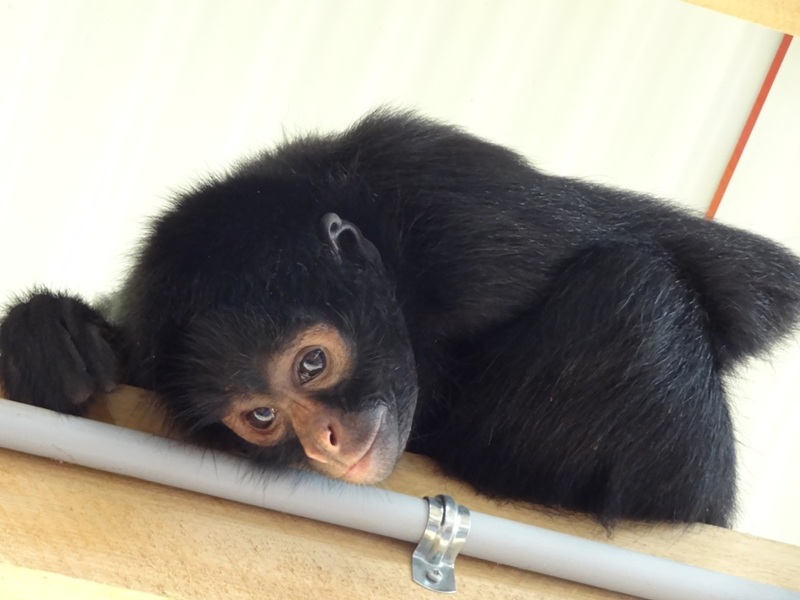 At 7 p.m. dinner will be ready and at 9 p.m. the employees of the Lodge will once again tiptoe along the rooms to shut off the kerosene lamps – and to leave us merely listening to the sounds of the jungle and falling into a deep sleep. 2ß February, 4 a.m.: “knock-knooock, good morning!”. Aldo, our guide, is giving us our wake-up “call” by tapping on our walls. This is the beginning of a long day with a big program ahead of us. Although I had already gone to be at 8 p.m. my romantic idea of falling asleep to the sounds of the jungle had only partly come true (that is, the falling asleep part) because I was woken up every 20 minutes by the rodents (mice, rats) racing around in my room, making a lot of noise and by my snoring neighbor from next door (since the whole are is open space towards the ceiling there is no such thing as sound-proof). So rather sleepy I dragged myself to breakfast and at 5 a.m. we headed off to Oxbow lake via boat and a 30 minute walk – in pouring rain of course. On a little wooden catamaran we were rowed along the shores of the lake where we got to see some rare, endemic birds, the eyes of a little caiman sticking out of the water (caimans are a kind of alligator) and we were also able to try our luck with piranha-fishing. Tiny wooden sticks with a string and a hook attached is all you need. Well, and of course a chunk of meat on the hook helps. I imagined you would need to wait quite a while until something would nibble on your hook but as soon as I put my line in the water I could see the fish go crazy just below the surface, fighting for my piece of meat – which was cleverly eaten off within seconds! I tried my luck a couple of times but the little buggers where smarter and quicker than me. Some of the other guests caught some piranhas so we were able to examine them from close up which was very cool. Our guide took a big leaf and held it close to the piranha and the little guy bit a nice pattern into the leaf with his sharp tiny teeth. When I offered him one of my long nails to bite it short it refused and instead preferred to give the leaf another trim one again. Amazing how sharp those tiny teeth are! 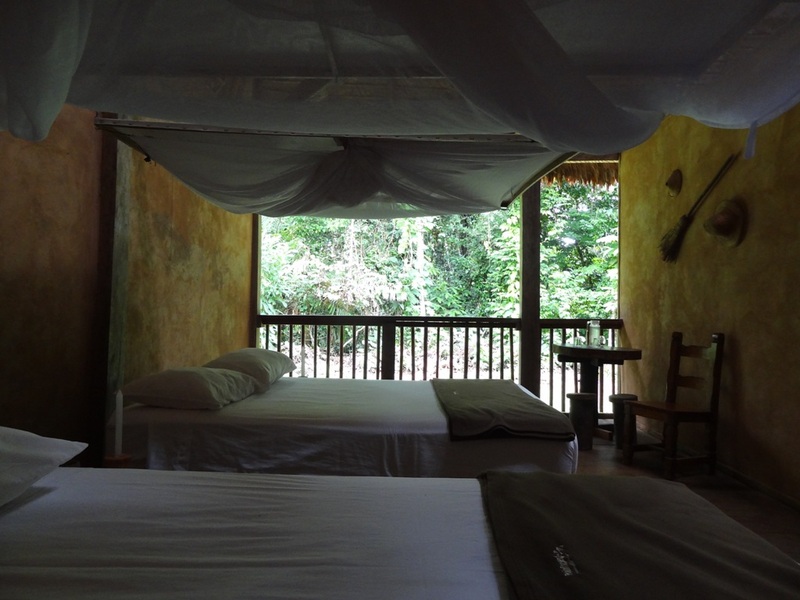 After the early morning excursion we went back to the Lodge, had a short rest and then headed out to the Macaw clay lick. It is basically a clay wall where macaws and parrots fly to every day to feed on the clay which they need to compensate the high and poisonous amount of acid they get from eating (unripe) fruits. 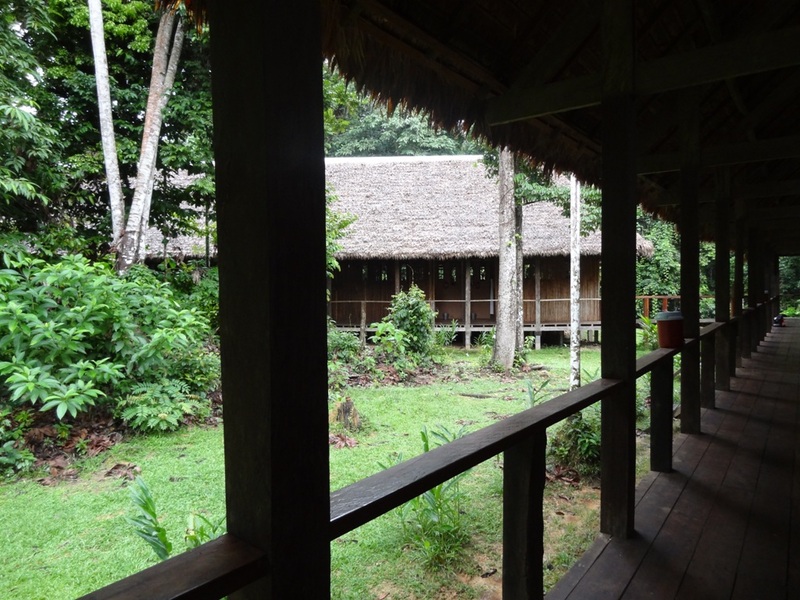 Unfortunately we didn’t see any macaws on the wall – rainy season is not the best time for it. After lunch we visited a botanical garden which belongs to a shaman (a healer). 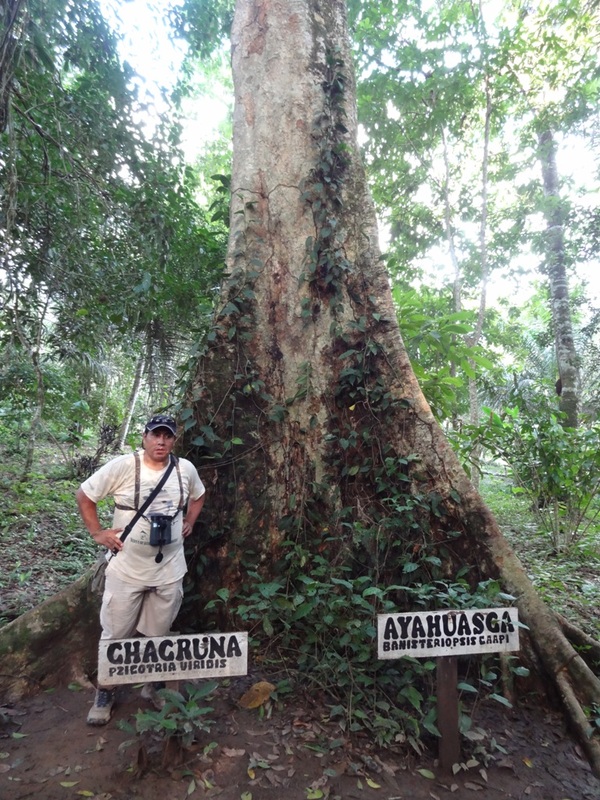 He and the guides explained a lot of plants and their medicinal use to us which I found highly interesting. Not only because it is amazing what wonders those plants can do but also how people found out about their effect in the early days. There must have been quite a lot of “trial and error” cases and fatalities because many of the plants are poisonous if used incorrectly. 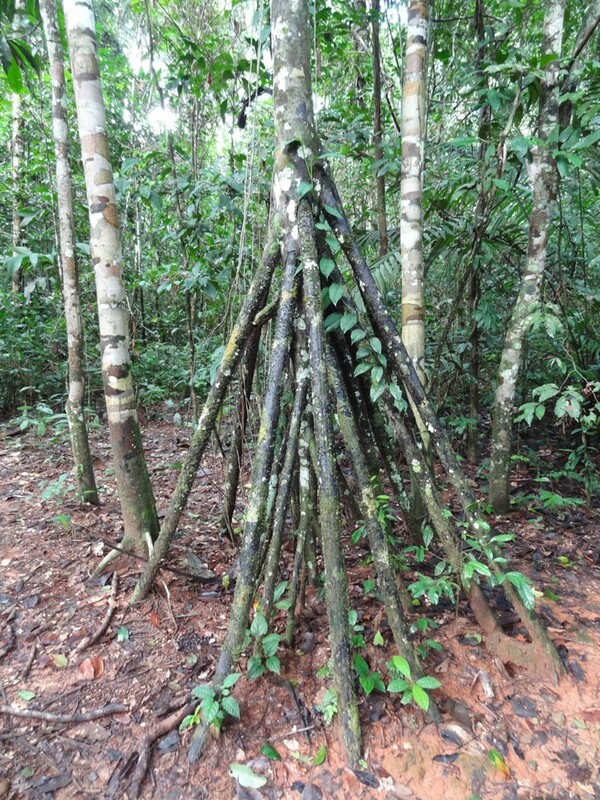 The shaman lives in the forest and produces all medicine himself. 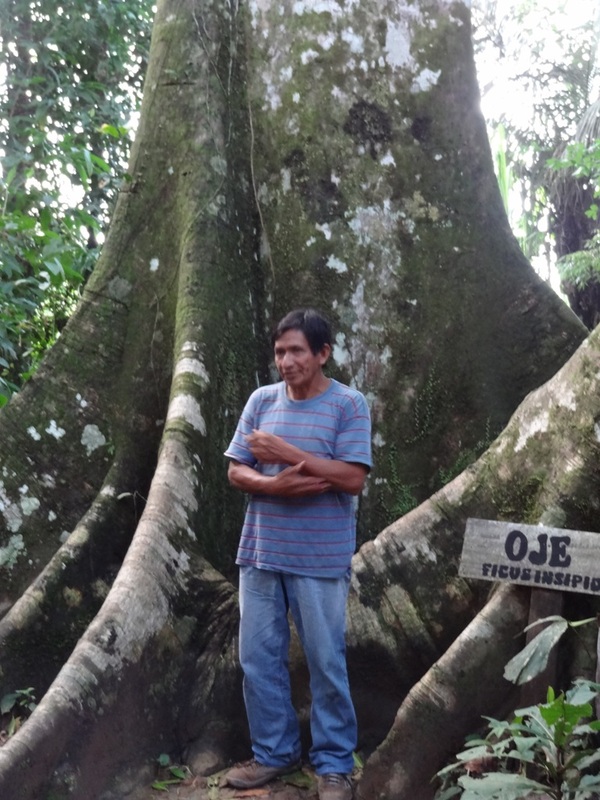 The people who live in the rainforest communities in the area come to see him when they are sick and treatment to them is for free. There are also foreigners coming all the way to see this shaman when they are sick and want to find out the cause and remedy for their sickness: after a strict diet for 3 days they go through a very special ceremony (ayahuasca wine) together with the shaman, drinking a wine brewed from 2 plants which have a dizzying and at the same time mind-expanding effect (caused by the hallucinogenic effect of the plants) where the shaman can read from the patient’s mind the cause and also remedy for the patients sickness. During our walk through the medicinal garden we saw plants whose enzymes are used for curing Parkinson, cancer, kidney problems, Malaria, impotence and many other things. We even got to try our one of his herbal medicine which strengthens the immune system and gives you energy (would have loved to buy a whole swimming pool full of it!). 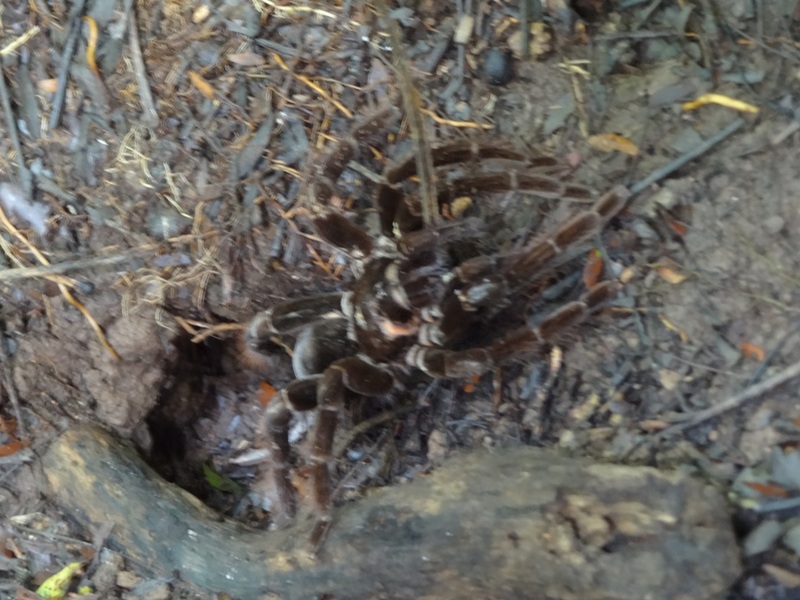 This was one of my favorite experiences of the rainforest trip. 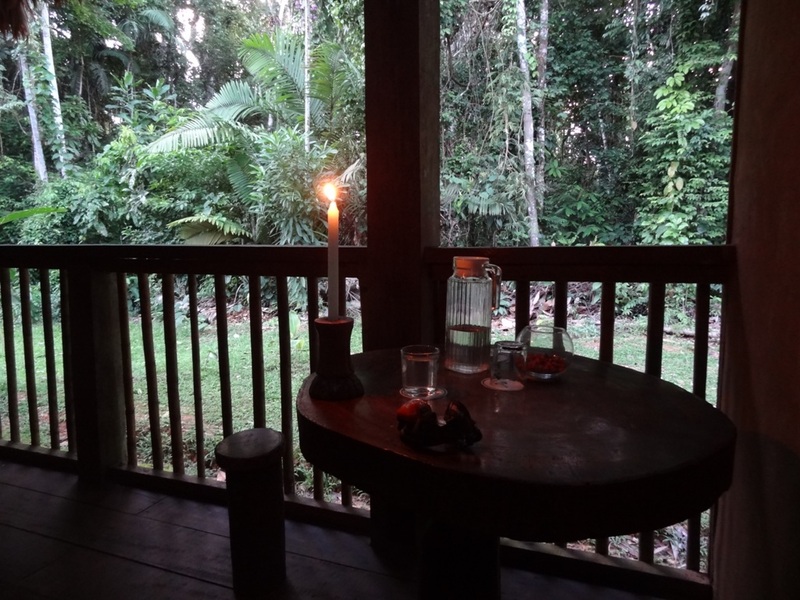 It is 8.35 p.m. now and soon the lights will be turned off and I will have my last night in the jungle. 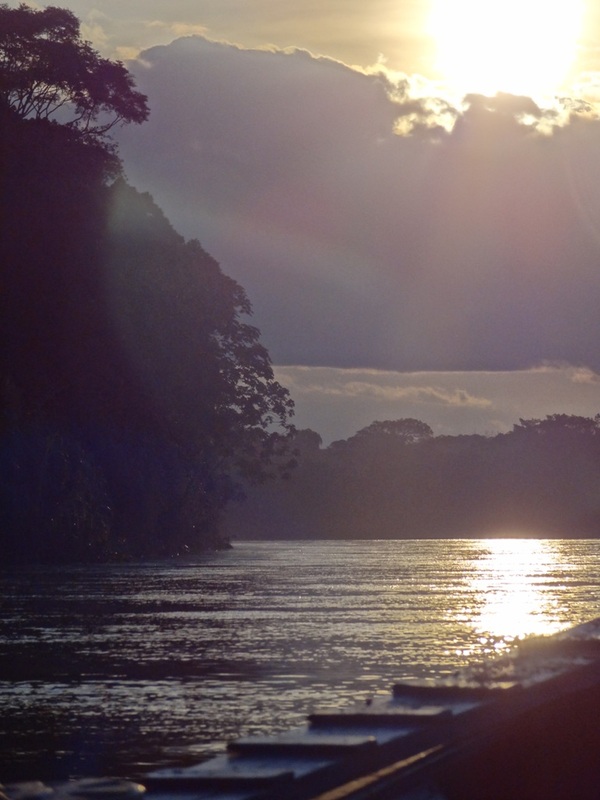 It was a really nice experience to come here to Tambopata National Reserve and to learn a lot about Flora, Fauna and the culture of the Peruvian Amazon and its people and it gave me a great “first taste” of the Amazon. I am sure it will not be the last time. P.S: Ken, this 0ne is for you! Sending you all the energy of the healing plants of the rainforest! Posted by Brita Graser on 12. March 2012 in Peru 2012 and tagged nature;wildlife;.